I am so ready for the warmer weather! We are getting rain and SNOW. Let's hope the forecasters are wrong and we don't get more snow. 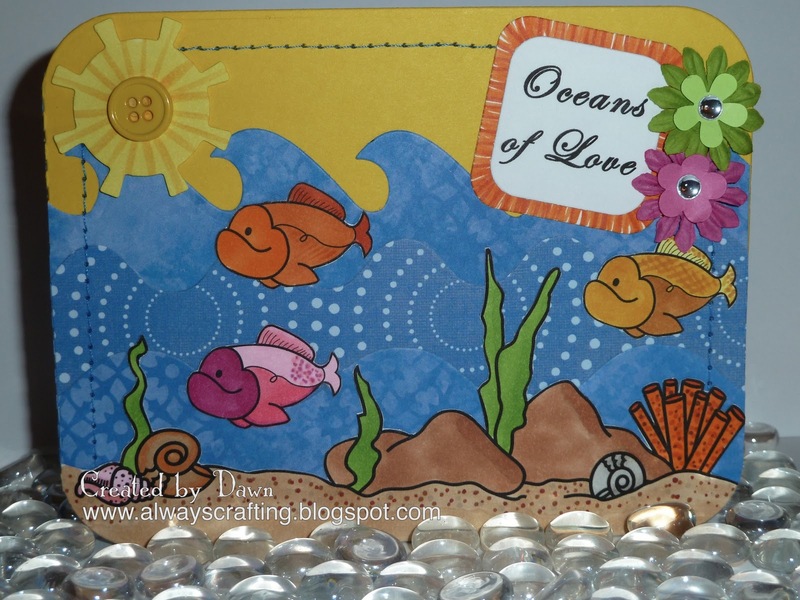 So trying to look toward the warmer weather, I made a summer ocean card. I got these stamps from Whimsie Doodles. Just love their stamps! Update: This card won the Digital Tuesday Challenge - For the kids here. I am so excited! On this card I used, Whimsie Doodles Beach Borders digi stamp and a fish digi from the Fish Tales stamp set. The waves are made from the Quickutz waves dies and the sun is a quickutz sun die. Copics were also used on this card. Such a cute card. Lots of colouring. Lovely stitching too. Thank you for playing along in this week's Creative Belli Blog Challenge. Good luck. What a funny card! Love the colours and the cute fishes. Thanks for joining Charisma cardz this week! See you soon! Cute card and great colors! Thanks for Cooking it up with Katie this week! Hi Dawn I just love the cute little scene you have created. Goodluck at Charisma this week. What a fun card with these funny fish! Thanks for joining us in the Belli Challenge. Oh this is adorable. I love the bright colors. Thanks for joining us at the Creative Belli Challenge. ha! what a cute little scene! i especially love the funky sun! thanks for playing at Charisma this week, and good luck!